Planning and organization of the wedding - consuminga process that requires time and effort. At the planning stage the question arises: where to spend your long-awaited triumph? Banquet Facilities restaurants, ride in a limousine and classic outdoor photoshoot tired, I want to celebrate a unique event interesting. Country wedding in the manor - it is an opportunity to spend an unforgettable honeymoon, a fabulous celebration that will long be remembered by all those present and leave a lot of pleasant experiences. Number of guests. If the future spouses are not going to organize a large-scale celebration with hundreds of guests, you can rent the estate for weddings relatively small size to accommodate 20-30 people. Theme weddings. The bride and groom must be chosen according to the estate scope and theme of the holiday: for wedding prom suit mansion with a huge hall, where couples in beautiful gowns will spin freely in the dance, and modern elegant ceremony can go with a simpler environment. The style of architecture. Each construction period corresponds to a unique style of architecture, which creates the appropriate atmosphere. For demanding young people, there are different options for rental estates - from old houses of the seventeenth century to the more modern estates built in the nineteenth century. Availability of facilities. There are various types of estates - some are not intended for further guest accommodation, accommodation, other, more modern versions, provide individual guest rooms, showers and so on. Surrounding area. 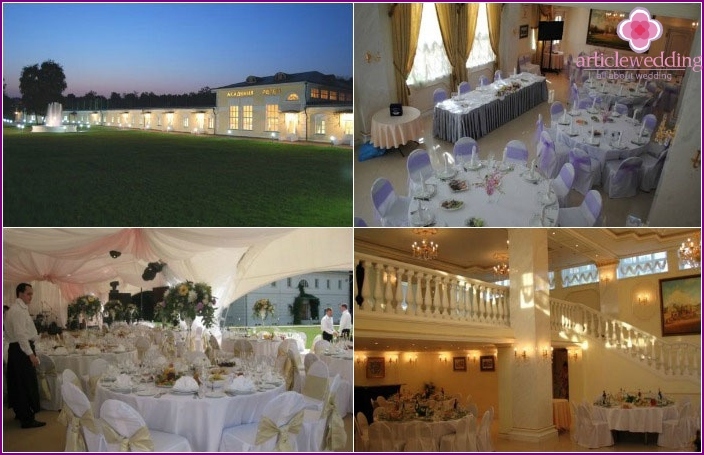 wedding Manor is a mansion located, as a rule, far away from dirty urban environment. Perpetrators of celebration can choose the estate, based on preferences in natural terrain - this can be a woodland ownership next to a river or manor with a neat, well-kept park. Transport connection. 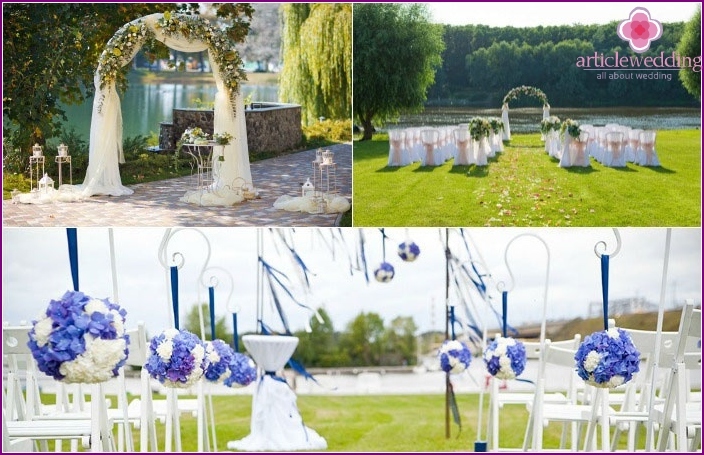 When planning a wedding at the estate, should consider the possibility of inviting guests for coming to the venue. If the homestead is located far outside the city, and some guests have a car, think about how to hire carriers. Wedding arch. This arch will be a place, in front of which the bride and groom will enter into marriage. There are many variations of this accessory for a wedding - the arch of balloons, wrought iron, wood. Decorate this item can be artificial or natural flowers, tissue, balls. Table registrar. The accessory is designed for the convenience of the painting of the intending spouses. It can be decorated with the same elements as the rest of the space. Carpet. As long carpet heroes of the festivities will go to the registrar's table. Sam the carpet completely replaceable by other elements - such as hay (if it is a wedding in a rustic style). Also, land on which will go to the bride and groom, will designate rose petals. Chairs for visitors. The striking action will be watching the guests sitting several rows. 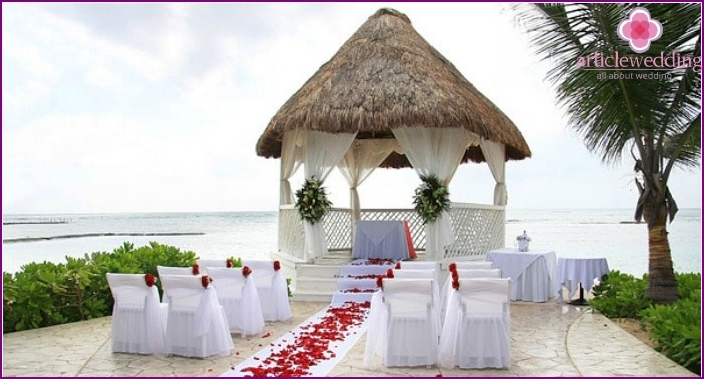 Chairs can be simple or beach wood, with elaborate carvings. Decorate their turn fabrics, flowers and ribbons. Young people will also have to choose a color scheme that will become the basis for a thematic wedding. The perfect combination - a bright, tranquil background with contrasting delicate or bright shade. Here are the top 5 estates that heroes of the occasion can rent for a great on-site wedding. Manor in Kuzminki. This aristocratic small estate on the right is one of the most popular destinations of outbound celebration. It was built in the 18-19 centuries. Around the manor spreads artificially planted park, on its territory there are three lakes where the couple can spend a photo session. There is a banquet hall, place for a wedding, the opportunity to register at the stable yard. Rental price - 120 000 rubles. Organization of feasts during the weekend - 230 000 rubles. Manor Chistye Prudy. Location is ideal for weddings on a budget and can accommodate up to 180 people at a banquet. This unique piece of architecture of the nineteenth century is a huge house with several rooms, a patio, seating area. Decorate the mansion marble columns, artsy Russian Baroque, wooden parquet. Wedding in this manor will long be remembered attending guests and an unforgettable experience for a long time. Manor Rent - 80,000 rubles. 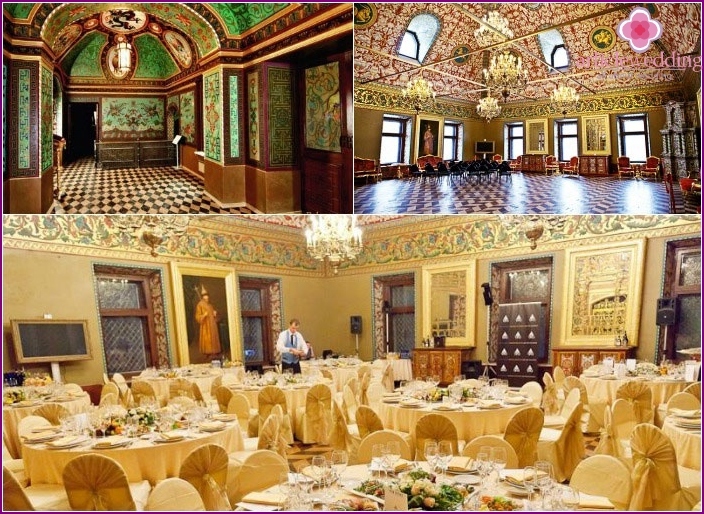 Price banquet - 3000 rubles per person. 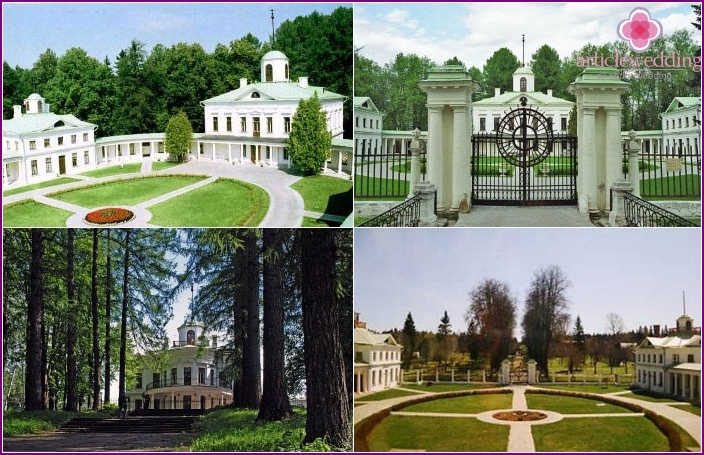 Serednikovo estate near Moscow. This option is ideal for young people who appreciate the elegance and luxury. It began to build in the beginning of the sixteenth century - the construction of the manor complex lasted for many years. The current view of the beautiful Manor is a restored architectural and park complex. Clean air, arched bridges, custom terrain - perfect for couples who want to celebrate a wedding away from the bustle of the big city. The cost of rent - from 600 000 rubles. Ostafyevo Manor (Moscow region). This monument of Russian architecture was built in the nineteenth century. On the estate is the church, two-storey house, beautiful linden park with a pond, where the couple will be able to arrange the original photo shoot. Distance from the town and beautiful nature will help guests have a good rest, gain strength. Also, the organizers will arrange for the heroes of the occasion stunning fireworks after the ceremony. Rent before clearing the estate - 150 000 rubles. Price menu - 4500 rubles / person. Palace Volkov-Yusupov (Red Gate). It was built during the reign of Ivan the Terrible. 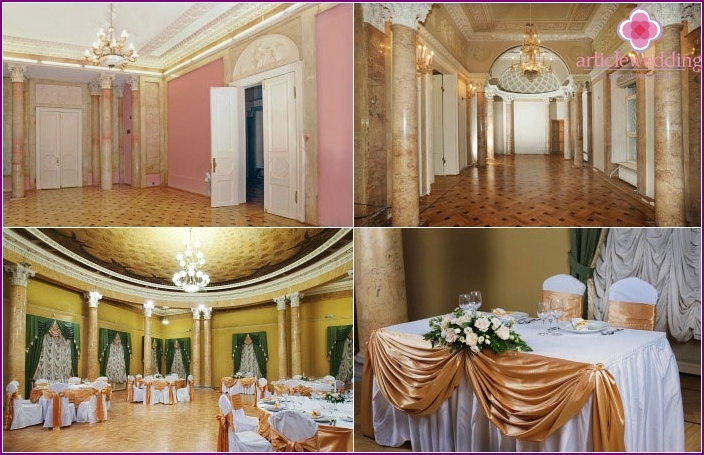 Gorgeous, fanciful architecture, spacious rooms, a noble finish areas - all waiting for the bride and groom who have decided to arrange a memorable wedding in Moscow. The setting will cause the heroes of the occasion feel like real aristocrats. After celebrating the triumph of the palace Volkov-Yusupov, the couple will long remember udavsheesya event. Cost of rent - 350 000 rubles. Menu - 4000 rubles / person. At the wedding in the mansion certainly worth a calla professional photographer who will capture elegant celebration. Photoshoot in a magnificent estate will be an interesting event for invited guests - who does not want to stand out in exquisite evening dresses and neat suits against the backdrop of a masterpiece of ancient architecture? A bride in a white magnificent dress walking the marble staircase, will look like a real princess, descended from the pages of a fairy tale. Rural homestead - unity with nature. If the wedding is held away from the city, surrounded by nature, young people will be able to relax. Clean the area will provide energy boost, give guests the opportunity to feel healthier than in a dusty urban environment. The surrounding nature will be pleasing to the eye are present all the time of the event. The closed area. Renting estate, heroes of the festivities completely get it to your order on the time of the wedding. They can invite relatives, friends, good friends and spend a comfortable holiday with a feast, a walk in the park, photos, without having to worry that someone would violate their personal space. Architecture. Magnificent examples of architecture of 16-19 centuries will give a real sense of a royal feast. The audience will feel like aristocrats invited to the ball, organized by the royals - the groom with the bride. Many agencies provide services to service waiters and cooks, disguised under the style of past centuries - it will strengthen the sense of the architecture. Expensive. Often, remove an appropriate manor, can cost a fortune, but there are cheaper and more modern options for this. The lack of reception. Some estates that are away from the city, do not have a special complex for poslesvadebnogo accommodation. Celebrating a wedding in such a manor house, it should be pre-booked rooms nearest hotels. Transport. Country estates options, tend to have an uncomfortable transport permit. This can become a big problem for guests without their car. The inability to remove the estate entirely. Some of the estate allows you to rent only the outer court or a hall. 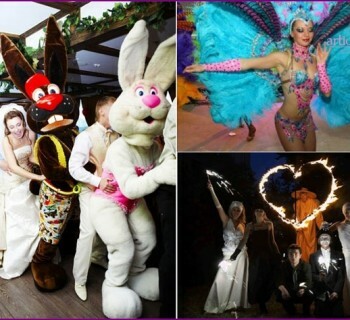 Disadvantages manor wedding, compared toadvantages are small - each pair will be able to choose the place, coinciding perfectly with their capabilities and needs. The original event on the estate will be a boon not only to the couple but also guests who will be immensely glad event. All are surrounded by nature, which sets a good mood for the entire holiday. What should be a program for the wedding?